For the past year, my primary form of transportation has been my 1974 Volkswagen Super Beetle. 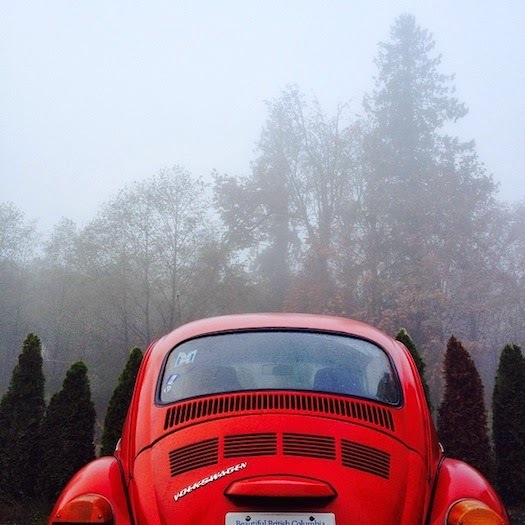 I bought Jim the Bug (named after the original owner) from a beloved friend in Washington and drove it 300 miles north to BC, where he has been a faithful companion. Driving Jim has been like living in a parable. I've learned so many life and ministry lessons from sitting in the busted driver seat and revving the cold engine, shifting the stiff gears and wiping down the fogged-up windows on chilly mornings. Prayer. Every time I get into Jim, I say a prayer: "God, may this engine start." Every time I get on the highway and the car starts to shake around 50 mph, I say a prayer: "God, protect me--don't let this Beetle crash." Every time the car idles at a light and the RPMs suddenly drop and the engine shutters, I say a prayer: "God, get me and this Beetle home safely." Because there really isn't much of a stereo in the Beetle (though that has recently changed, thanks to my friend Josh, who installed a CD player and speakers he found from another Super Beetle in a junkyard), I spend my commute in silent prayer, a quiet commune with the Lord. Driving the Beetle has strengthened my prayer life. Prayer is absolutely essential for life and ministry, yet so often becomes an afterthought in the busyness of serving the Lord. Driving Jim reminds me to pray first, before I do anything else. Simplicity. There are no bells and whistles with the Beetle. The engine is simple and straightforward, and even those who aren't mechanically inclined (like me) can do routine repairs. The interior has everything one needs--seats, seatbelts, three pedals, steering wheel, manual windows and locks, etc. Our family's other car has a huge sun/moon roof, heated seats, air conditioning, an mp3 plugin, and power everything. The Beetle doesn't need all that. It's simple and clear, which is uniquely attractive. Simplicity in life and ministry are also attractive--rather than having an overly cluttered and programmed schedule filled with a wide variety of spiritual bells and whistles, a ministry of simplicity and clarity is refreshing in a congested world. I'm learning I need to cut out the ministry programs and endeavours that aren't essential to the mission. Endurance. My Beetle is 40 years old, yet it's still going strong. Even though he's got plenty of rust, the seats and interior need changing, and the engine needs continual maintenance, Jim the Bug certainly hasn't gone out of style or given up his last breath. In whatever weather, in the craziest of circumstances, the Beetle just. Keeps. Going. The Beetle endures. I've heard so many Bug stories from people about how their car broke down--the driver's door fell off, the windshield wipers froze, the gas pedal stopped working, the wiring was fried--yet they still managed to drive it home! Due to its simplicity and classic style, the Beetle is sustainable. I want to have the discipline of endurance in my life and ministry--I want to face difficulty and obstacles with a confidence that they can be overcome, that God is faithful to the end, and that the best is still yet to come. I want to live a sustainable life. Maintenance. The reason the Beetle can endure is due to routine maintenance. A Beetle left to itself for long enough will ultimately fall apart. It needs oil changes, new filters and spark plugs, and a constant supply of fuses, lightbulbs, and various mechanical necessities packed into the glove compartment. My car is filled with manuals and tools meant to make a repair on the run. I'm continually opening up the engine compartment and looking inside, checking belts and bolts and wires. It's easier and cheaper to do small ongoing repairs that come with maintenance rather the costly repairs that come with an engine failure and breakdown. The same goes for life and ministry: regular evaluation, maintenance, and accountability will keep me from burnout and moral failure. I need to be making constant repairs and adjustments in order to keep my gauges full and my life running on all cylinders. I'm grateful for my Beetle, not only for getting me from point A to point B, but for the instruction it gives me as we travel through life together. Which Beetle lesson resonates with you the most? Got a Beetle story? Share it in the comments!